I am not a bird person. Don’t get me wrong, I do enjoy the pleasant background chattering of birdsong. It cannot help but lift your step to hear them sing when you notice to listen. But birds themselves do not move me. Except for one kind. This particular bird is not one whose sight is stunning to behold. They are very plain, actually. But their song is very haunting to me. My penchant for the mourning dove began when I was a child. My grandparent’s house has always been the home of my heart. I still dream of it as a place of peace even though it has been owned by others now for many years and my grandparents have long since passed on. I still own a few things that they have given to me and I cherish them. My grandfather handmade a wooden rabbit ornament that still hangs on my Christmas tree every year. My grandmother sewed a baby blanket for me at my birth that is still in wonderful shape. I have given up keeping it in the linen closet because my five year old daughter continually pulls it out to cuddle with or use in her play. I have a random maroon scrunchie that is stretched out beyond usefulness that stays with all of my other hair doodads. I cannot bear to throw it away because my grandmother made it. I remember when she gave me several handmade scrunchies exclaiming that she couldn’t believe what people would pay for them when they were so easy to make. I also treasure the locket that was left to me when my grandmother died. It holds a picture of my grandparents on their wedding day on one side and a picture of them on my father’s wedding day on the other side. And I still wander the rooms of their home in my mind. I remember many small details that only a child would embrace: The uneven slope of the laundry room floor; the dim lighting of my grandfather’s workshop; the stiff, but oddly comfortable, drab couches in the living room; the porcelain knickknacks that were arranged lovingly in many corners of windows and cabinets; the hideously pink bathroom with matching toilet rugs; and the singing of the mourning doves when I would awaken each morning that I slept in their home. Whenever I hear the mourning dove’s song, it stirs a comfortable place in my heart and sends me backward in time. But the song is sad, too. It speaks a plaintive, but continuing hope. I have never lived in a place where there was an abundance of mourning doves near my home. I have always occasionally heard or seen them, but never consistently. Happily, it seems that this is to change. 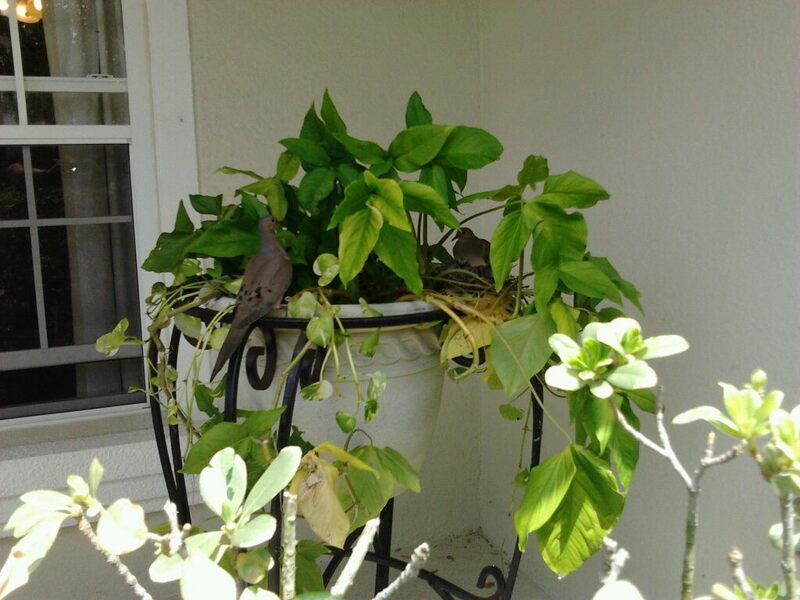 Recently, a mourning dove nest was built and sustained in a potted ivy plant on my front porch. The fledglings have successfully hatched and launched. I now hear or see one or another almost every day. And for the first time today, as I was contemplating my life out on my back patio, I heard two of them singing in harmony. What a beautiful sound that truly is.